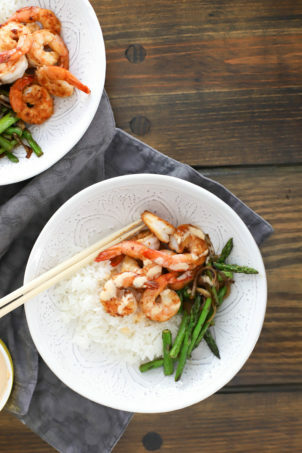 This is definitely, by far, the thing you should be making tonight for dinner. Or tomorrow. My super outdoorsy friend Weston goes on fishing trips in Alaska, and he brought over some halibut for us to cook earlier this week. The parmesan and dill preparation was something he’d had in Alaska at a restaurant, so he described it to me and this is what I came up with. It was SO good and easy! The pictures here are for 6 large pieces of fish, but the ingredients below are written for 4 portions – increase or decrease accordingly! 4 white fish filets, about an inch thick. 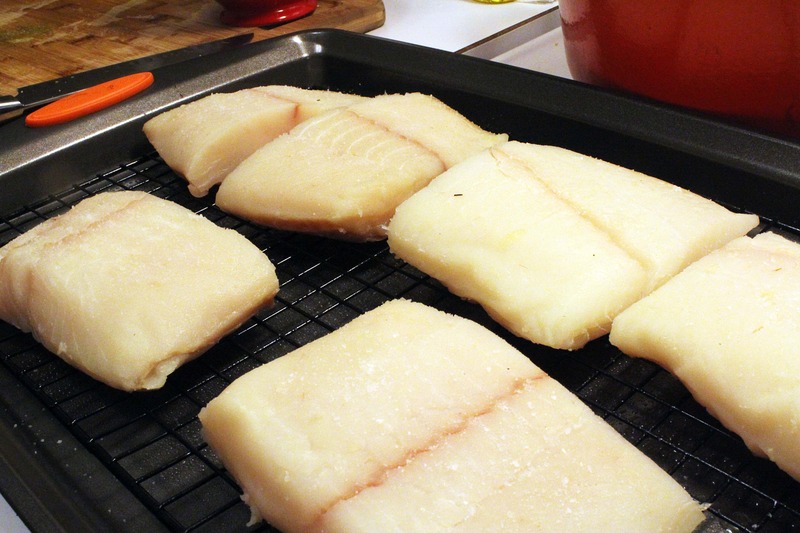 Halibut, cod, sea bass, or any very firm white fish is fabulous. I made the sauce first so it could get super duper flavorful for awhile before we ate. To a bowl, add the sour cream, mayo, and heavy cream. Then, using a teeny grater, grate in the garlic and lemon zest. 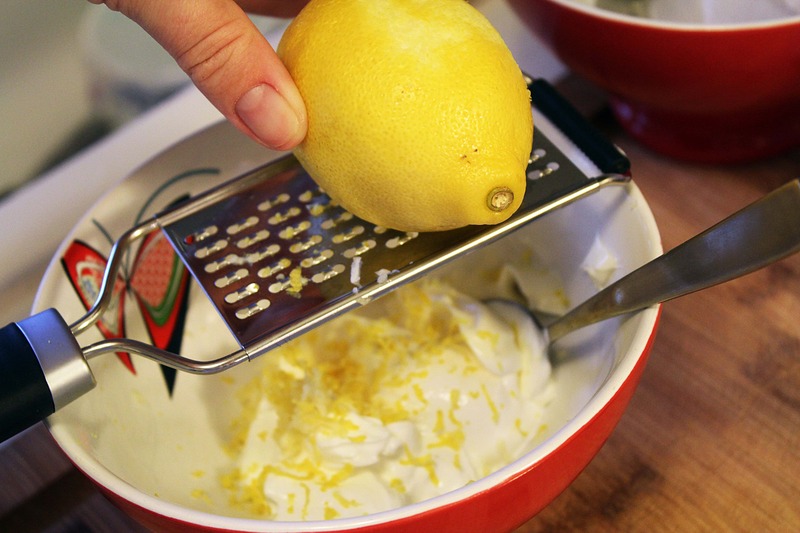 If you don’t have a handheld grater you can zest the garlic and lemon on the side of a box grater or just mince it really finely – no worries either way. Save the lemon for serving, and mince up lots and lots of dill – it’s the star of the show here! Add the dill to the lemon/garlic/cream mixture with a sprinkle of salt and pepper, then stir everything together. I got excited after the first stir and added more dill and pepper. Taste your dip and add more of whatever you’d like, though! Keep in mind that the garlic flavor will get a lot stronger as the dip sits, so don’t add more of that. Yum. Keep the dill sauce in the fridge while you get the fish ready. Incidentally, the dill sauce can be used as a veggie dip – who needs packaged ranch when you have THIS? Now, for the fish. 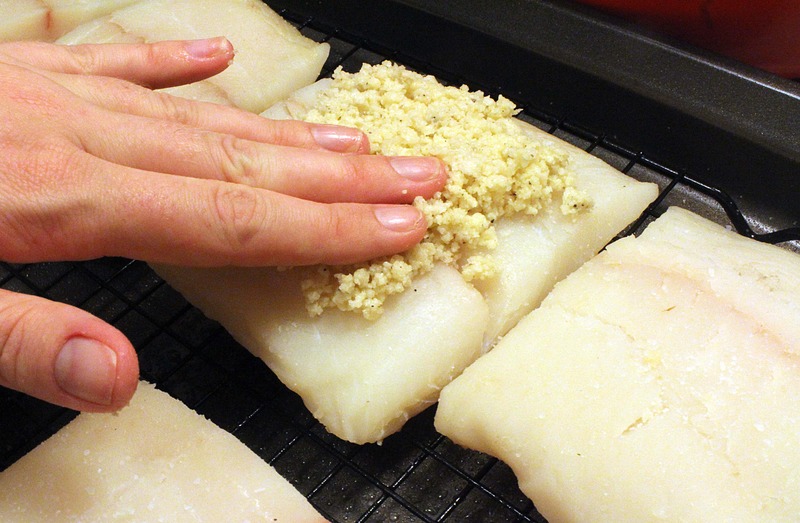 Preheat the oven to 400F and pat the fish very dry with paper towels, then salt both sides. I’m using a cooking rack IN a baking sheet to bake this fish, but you can use just a baking sheet, or a broiler pan, or whatever works for you. Seriously, look at this fish. So easy! 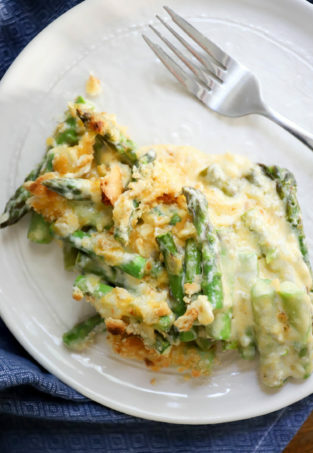 Melt a tablespoon of butter in a bowl, then add the panko, cheese, and pepper. Mix it all together lightly with a fork. I ate about three forkfuls of this. Sorry about that. Divide the topping evenly among the fish, then press it evenly into the top of the fish with your fingers – no need to kill it, just be sure it won’t fall off. Nice! NOW, at this point you’re ready to cook the fish. However, you could make the dip a day in advance and put the crust on the fish hours before you cook it to give you time to take a shower, clean your house, make side dishes, or drink 8 glasses of boxed wine. What I’m saying is, you can do this in advance. When you’re ready to cook the fish, bake it for 10-15 minutes until the top is lightly brown and the fish is firm and cooked through but not dry – if you have smaller pieces of fish yours won’t take as long! When the fish is done, pull it out of the oven and immediately spoon some of the dill sauce over the fish so it can get nice and warm. Then, transfer the pieces of fish to a platter (or to individual plates if that’s how you roll) and top each piece with more fresh dill. GLORY that looks delicious. 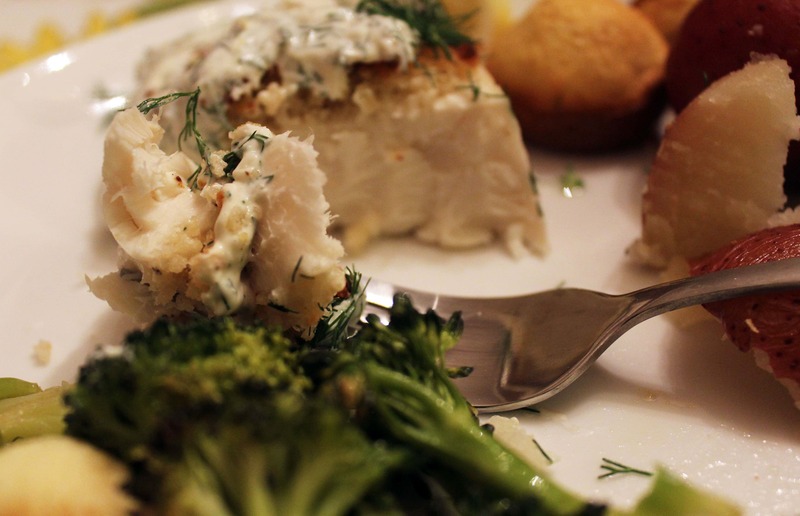 I served this so simply with roasted broccoli and cauliflower and steamed potatoes – the fish didn’t need anything to take away from how delicious it was! Serve this with extra dill sauce and the naked, zested lemon cut into wedges, and THAT’S IT. Promise. 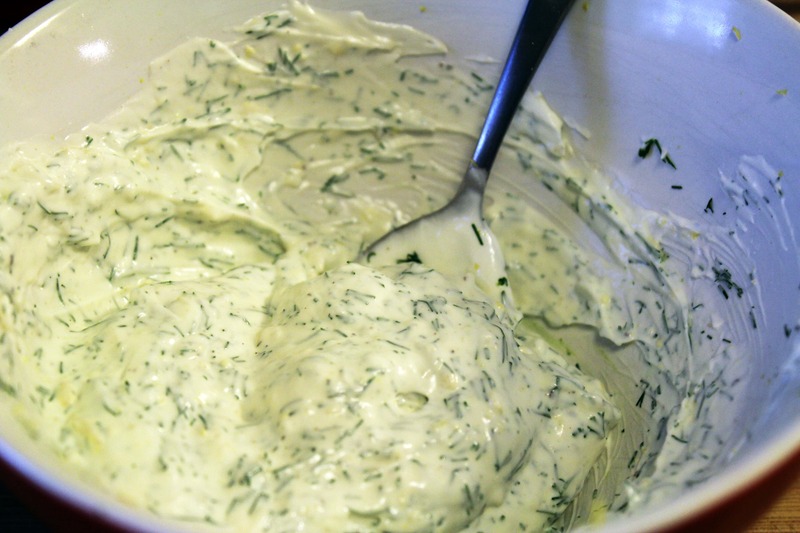 For the sauce, combine the sour cream, mayo, cream, lemon zest, garlic, and dill in a small bowl. Taste, and add salt, pepper, and more dill as you’d like. Set the sauce aside while you prepare the fish. Pat both sides of the fish dry with paper towels, and sprinkle both sides with salt. 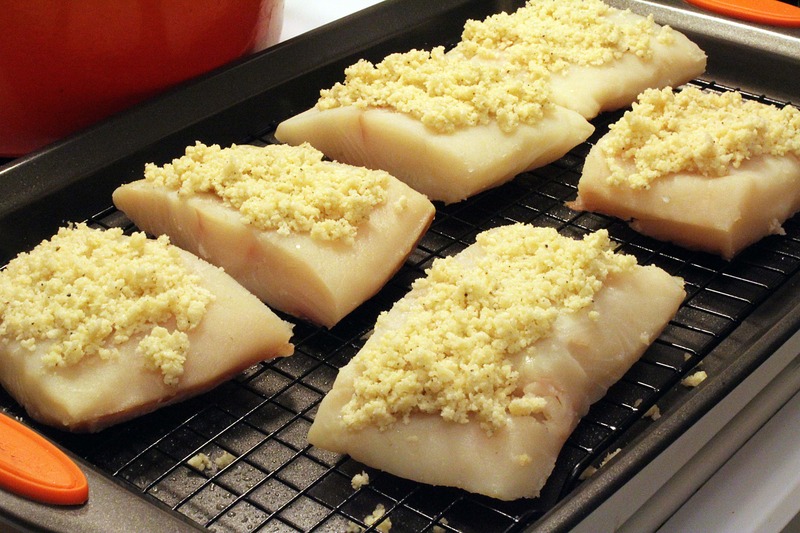 Place the fish on a broiler pan with rack, or on a baking rack set inside a baking sheet. 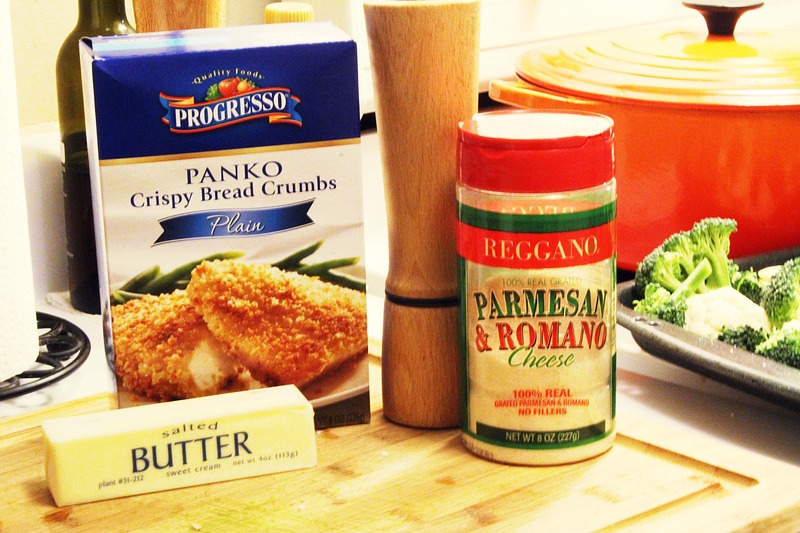 Combine the melted butter, panko, and parmesan in a bowl with a fork. Add a big sprinkle of pepper and stir together. 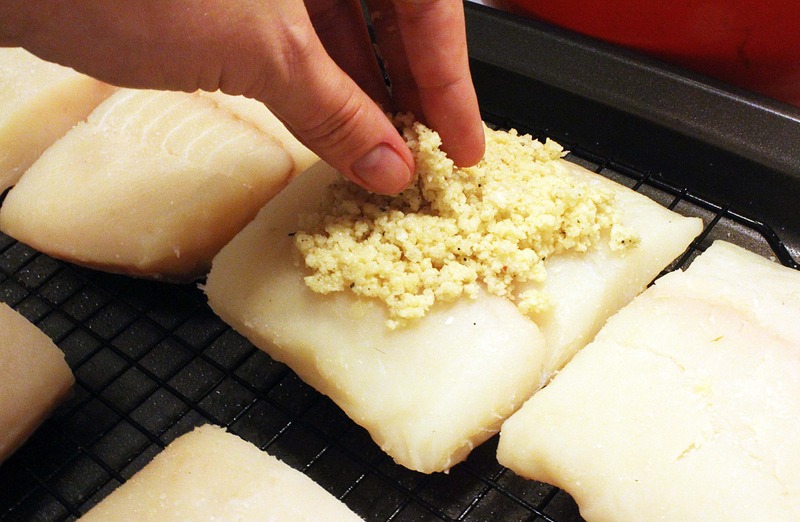 Divide the panko mixture evenly on top of fish and press lightly to form a crust on the top of each piece of fish. Bake the fish for 10-15 minutes (depending on how thick your fish is) until fish is cooked through and flaky and the crust has browned. 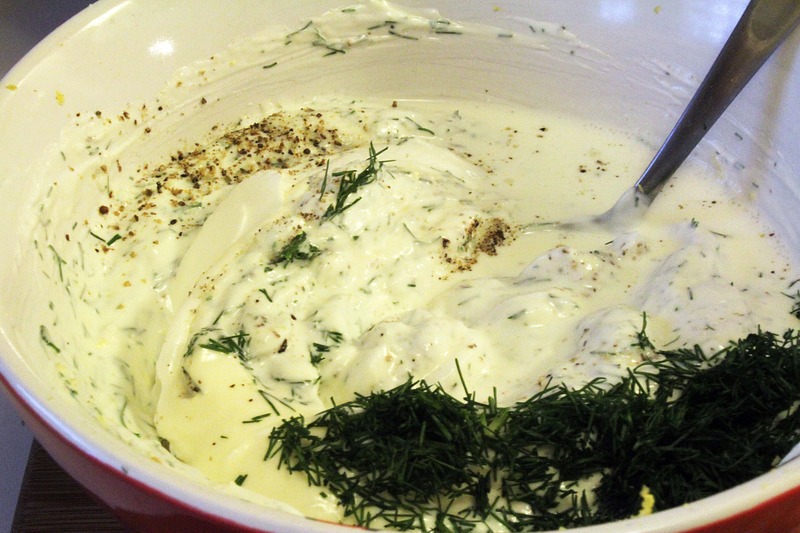 Spoon some of the dill sauce over the fish to warm it, then top the whole mess with extra fresh dill. 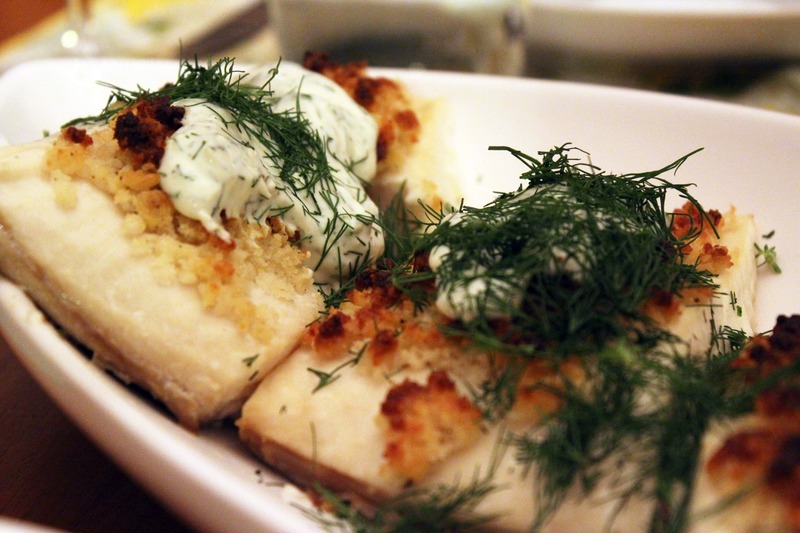 Serve the fish with extra dill sauce and lemon wedges. *sigh* So delicious, but such a hassle to even try to make in South Korea I’ll have to bookmark this for when I’m back in the USA. Ooh, yes, I bet. Maybe just a butter/crumb crust (any bread, just chop it with a knife!) and any kind of cream/mayo/sour cream/creme fraiche with some garlic or onion and whatever dried herbs you can find? If you let the sauce sit overnight they’ll reconstitute nicely! It won’t be identical….but close! Agreed. Sour cream is too hard to come by in South Korea… Looks divine. 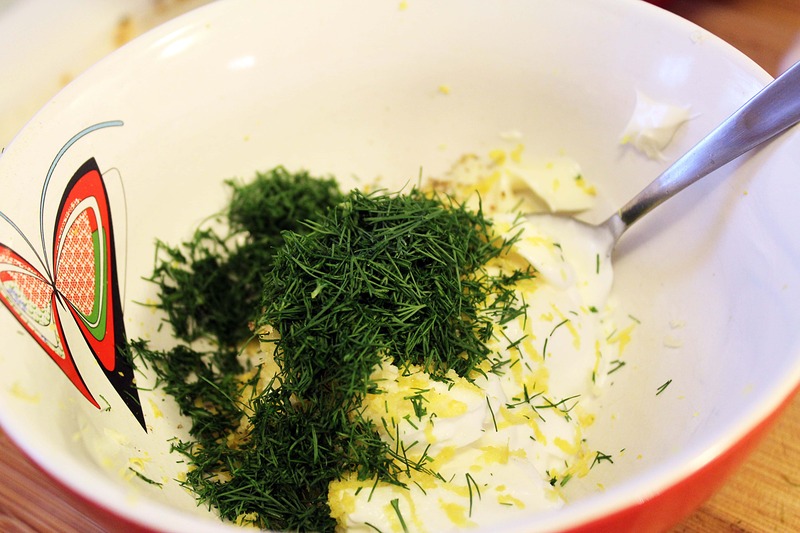 There is NOTHING- I repeat, NOTHING so good as dill, sour cream, and lemon in, with, or on ANYTHING- though fish is best. Love the Parmesan, adds another layer. Sort of like Norway meets Italy. Yumm. Thanks. Will try..
HECK yes. I just used it because I like the creaminess, AND if you were to bake the sauce it would hold up a bit better. Creme fraiche would work well, or all sour cream and cream with a teensy sprinkle of sugar. Play around with it, it’ll be just wonderful! that looks so good and just laid out perfectly. What I do sometimes with my fish is I will put some natural grape or strawberry jelly sauce and spread it evenly over the fillets. Let it sit in the pan for at least 10 min and it will end up turning a little sweet. I think it tastes really good. How much jelly? I use 1 tbs for each fillet. (Preferebly) Talapia. Ooh, that’s so easy and different! I’ll definitely be trying that. Thanks! Wanna know something bizarre? Just last night, I baked turkey breasts with a parmesan/panko breading. Seriously. Isn’t that odd? I really loved the recipe — and I’m really looking forward to trying this one out, too. So now you have an obligatory 1 week wait until you use that method again – I LOVE panko and parm together, it’s so nice and crunchy! Thanks for reading! Your photos are lovely, nicely lighted and clear. I like to make a creamier base, roll the entire fish in then turn into the crumbs on all sides. And you can easily make bread crumbs by pulsing it in a blender, or smashing stale bread in a baggie with a rolling pin 😀 I’ve had to make due many a time. MMmmmm. This looks so yummy. I may need to update my grocery list for tomorrow. Thanks for sharing. Wow! This looks delicious. I am always looking for different inspirations for cooking fish. Thanks! Let me know how it turns out – thanks for reading! Looks delicious and simple enough even for me to make. Love your blog! Looks so easy and delicious. I’ll have to try it when we are back in the US. I am not a huge fan of dill and you just made my mouth water. On way to store – we WILL be having this for dinner. Thx! 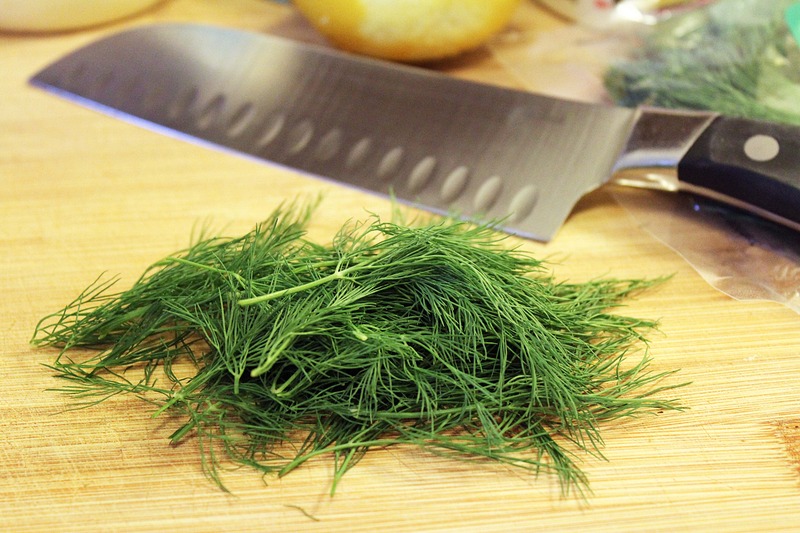 Dill is lovely and this is a pretty non-offensive way to prepare it. Let me know how it goes! Excellent recipe preparation photos and instructions! I bet this would taste great with salmon as well. I love salmon! Yum! 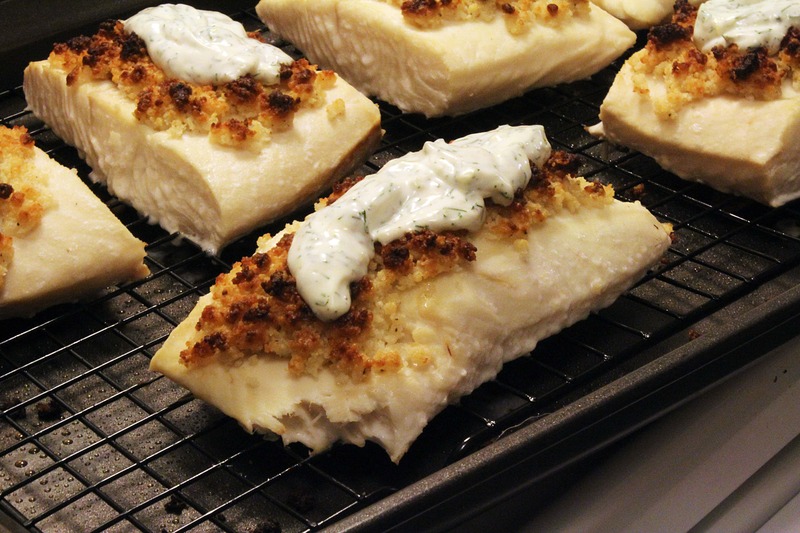 What a delicious way to get some crunch on your baked fish. Great idea! That does look really good! I love the way you prepared the garlic, I’ve never thought of that. 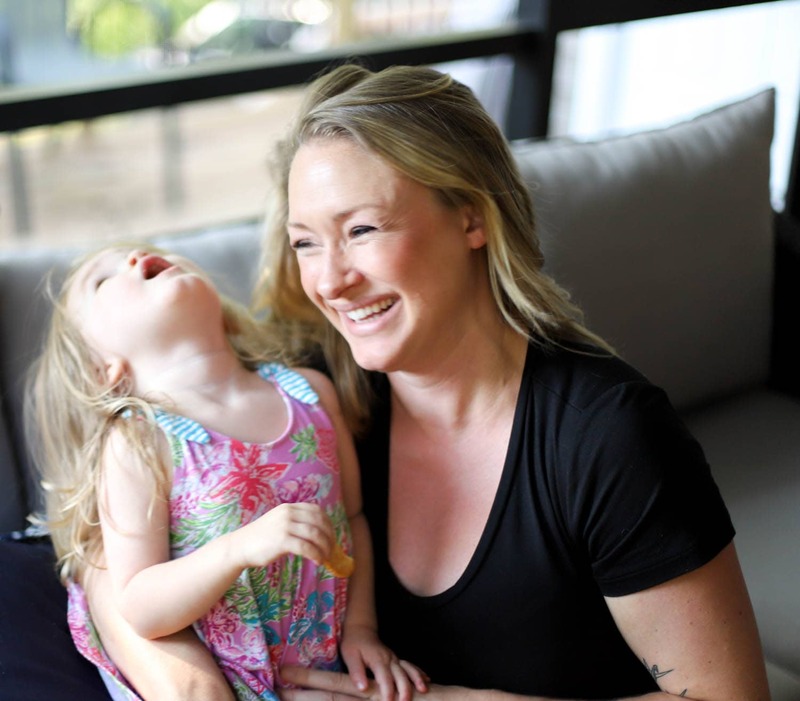 Advice via small kitchen gadgets – it’ll take you far in life, kiddo! This is a new recipe Ill be trying this summer, with my dill seeds I plan on planting! Thanks and congrats on Freshly Pressed! Holy Moly…it does look good…what a delicious, unforgettable meal…made me say, “Mmmmm….” Congrats! Happy Valentine’s Day! This looks fabulous. My mom makes a very similar dill dip and I have never used it outside the realm of vegetables *gasp*. I’m sure I’ll be putting it on everything now that you’ve opened my eyes to the endless possibilities. Beautiful work! Beautiful photos. I LOVE food, that’s probably the reason I created a Food category on my photography page, food’s so interesting to take pictures of 🙂 Great job! This looks so amazing I just had to re-blog it from FunnyLove! I love dill! This looks delicious. Thanks and congratulations on being Freshly Pressed! Mmmmmm…..mouthwatering stuff. Well done chef! I have not been good at planning ahead for birthdays and holidays, and living in Papua New Guinea makes things worse since there’s nowhere for me to run out to at the last minute. But thanks for this. We recently got a whole bunch of Marlin for about $1 per steak when we visited the coastal town of Madang. This dish reminds me a little of how I learned to prepare salmon that we caught in Alaska. So this is perfect. I’ve got three days to plan this and do something special for my dear sweet Mandy. I did it, and it turned out great! We managed to find just enough fresh dill at a friend’s house. I had to make our own sour cream from whipping cream and lemon. I followed your suggestions and cooked potatoes and broccoli as sides. The one glitch was that someone turned the oven off in the middle of cooking, so the fish was a little over done in the end, but not too bad. The broccoli was actually my favorite and won the spot for my last bite. We used fresh parsley on the potatoes and fresh basil on the broccoli. I added extra black pepper to the dill sauce and broccoli. I can’t get enough black pepper (and my wife said that only one bite of hers seemed like it had too much). We both loved it!. We also took your advice and had a little shiraz while we were waiting to cook the marlin. Then we opened a fresh bottle of merlot to have with the meal. Thanks so much for the inspiration! okay, I am reeeeeaally hungry now. Thanks for the recipe! I love dill.. thanks for sharing! 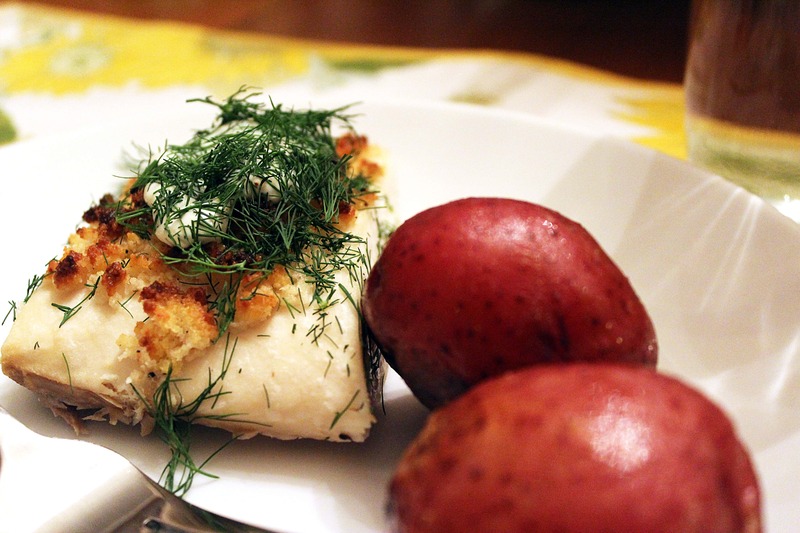 Parmesan crusted halibut what a great combination with dill! really nice, congratulations! Preparation pictures are great!!! This looks incredibly delicious. I love cod and haddock and I’m always looking for new way to cook it. I’m so gonna try this! Looks fantastic. I must try this recipe! wow, it looks so delicious, i can’t help but want to have a try, ha ha ! i love fish recipes. this looks so yummy! That looks fabulous, and so easy to do, too. I can’t have the bread crumbs, so I’m going to try substituting corn flakes. Yes that looks amazing! We always put dill on our salmon, but I will definitely be trying this mix with a white fish soon! This looks so good, I’ll be cooking it this week. Thanks. Yes please. I already sent this link to my wife. We are putting it in the dinner line up. Thanks. I don’t think I use dill enough. It has such a great and unique taste. Why grate the garlic and not smash it. I guess maybe because it is going into the sauce and you don’t want big pieces of garlic in it. Anyway, this looks tasty. Exactly! 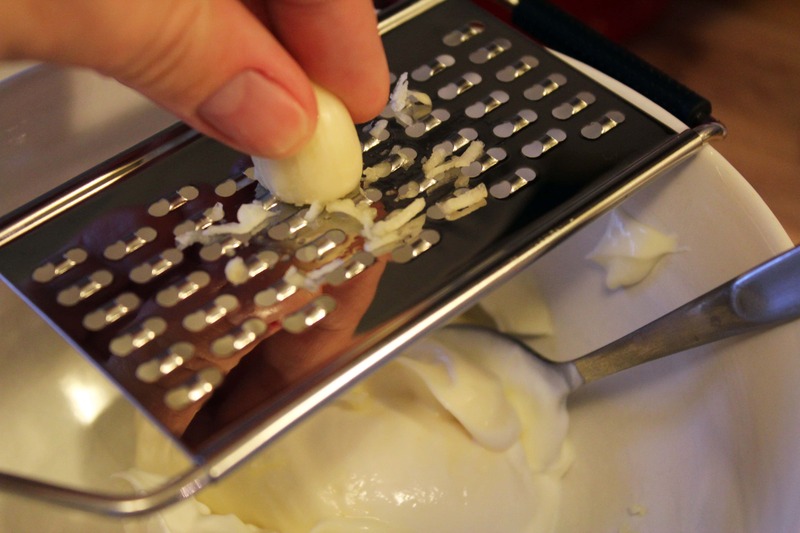 I like it in super teeny bits and the grater is so quick and easy! Will cook to wife on Valentines day. What fish you used? My mouth is watering just looking at the pics… going to have to try this soon! I was just thinking of how fish sounded really good and this recipe looks like it hits the spot. I always love fish with either a nice rice pilaf or as you did red potatoes are good too. If you do not think it too much you can make a roasted red with dill. Cut your potatoes into quarters and slather with olive oil, dill some garlic to kick up the flavor, and a little salt. Then roast them at 450 for about an hour. Reblogged this on Le Blog Reserveé. This looks so amazing- may have to make it for valentines day! 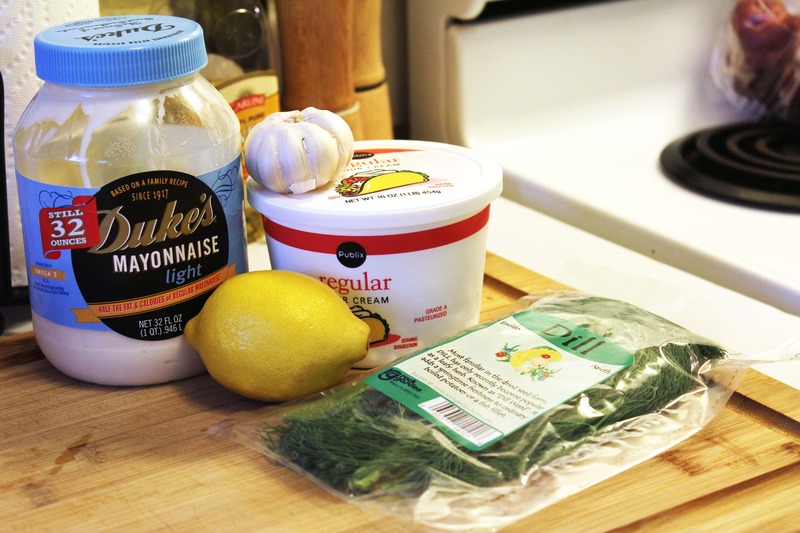 LOVE Dill Mayo, and you make it exactly how I do. We have it most with crispy, chewy Calamari Rings. Lush. Great work! Was just lamenting the fact that I am uninspired to make dinner. Not anymore! Yum. Can’t wait to try this. It is, and people are so obsessed with it down here! I admittedly don’t care, I just buy what’s on sale. Dont tell anyone! I’m always on the lookout for new fish recipes because we try to eat it more often. I love this combination of flavors and easy it is to prepare and… in advance! Bonus. I’m also on the lookout for new blogs to follow.. I’m a follower here and on Facebook now:) Nice to meet you! Thanks for reading! I’m with you on the fish eating…..fast, easy, and healthy is the way to go! This looks delicious! I really need to cook more fish! I have mine in the oven right now! and I am snaking on a small dish of the cheesy crumby mixture now! awesome recipe!!! It’s probably the best part! Let me know how it turns out! I am making this this week. I have parmesan and tilapia already. Thanks for the great idea! This looks delicious! Nice work. Tried something similar with chicken; first time using panko. Yum. Thanks for this recipe. This would pair really well with a wine cocktail. I tried this with an organic sangria. Two thumbs up for your fish dish!!! Looks delicious, I’m definitely going to give it a go! Sounds divine! My mouth is watering! . . . Thank you for sharing! The boyfriend somehow acquired a whole salmon recently and I’ve been thinking about how to fix it…I might try this, even though your recipe uses white fish. It sounds delicious! I have seen nearly this exact preparation for salmon. Go for it! some great food – yum! This looks v.nice! I’ve only just started liking fish but this looks like a meal I’ve got to try! I had garlic but other than that this sounds so yummy! Looks awesome… now if only I can get the fiance to eat it! You are a great cook, I’m sure of it! Practice lots, and ask questions anytime. Thanks for reading! That dill sauce looks so good we don’t know whether to eat it or dive into it! Both work well in my experience. Enjoy! looks delicious! and simple enough for me to do….we want to eat more fish, but never know how to prepare it. You can definitely do this! Let me know if you have any questions, I’m happy to help! White fish is a great way to start – the flavor is very mild! i love eating dill. 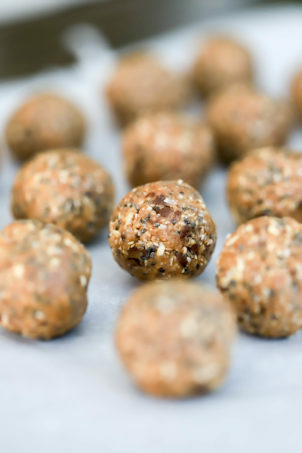 Nice blog for a Superb and very tasty recipe. That’s a lovely sauce. I just made some lemon and cream spaghetti and would love to hear what you think. See ya around! Your pictures are fabulously mouthwatering! My family is trying to eat more fish…more than none that is. Haha. 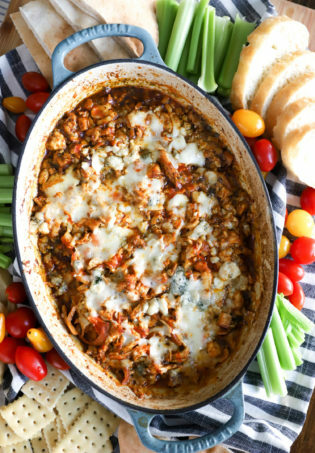 This recipe has lots of flavors we love, so I think we will give give it a try! Thank you so much for posting. This was delicious! I made it with tilapia (since that’s what I had). This one is ranking up there with my favorite recipes. Thanks for sharing! I’m so glad you enjoyed it! The toppings can be used with any fish…they’re just so dang delicious! Just wanted to let you know I’ve made this recipe three times already.. tonight will be the fourth. My whole family LOVES it. Even the kids! Thanks so much for sharing. 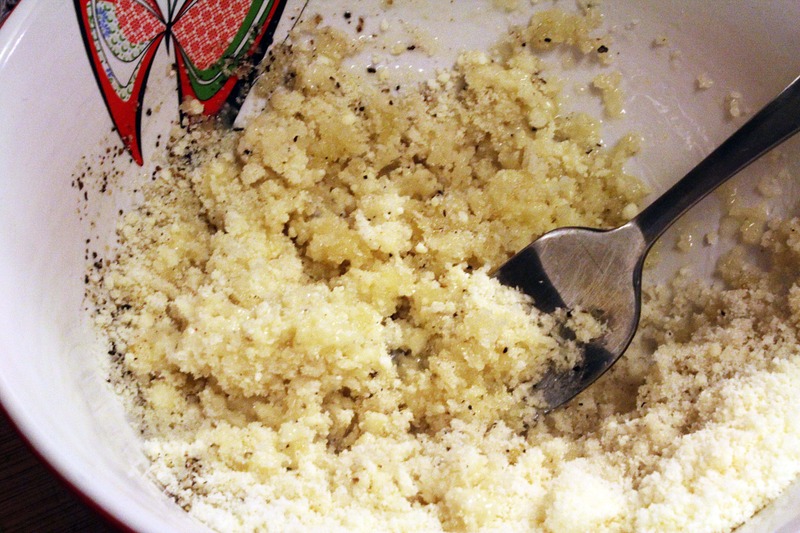 I use freshly grated parmesan cheese and it’s fabulous! 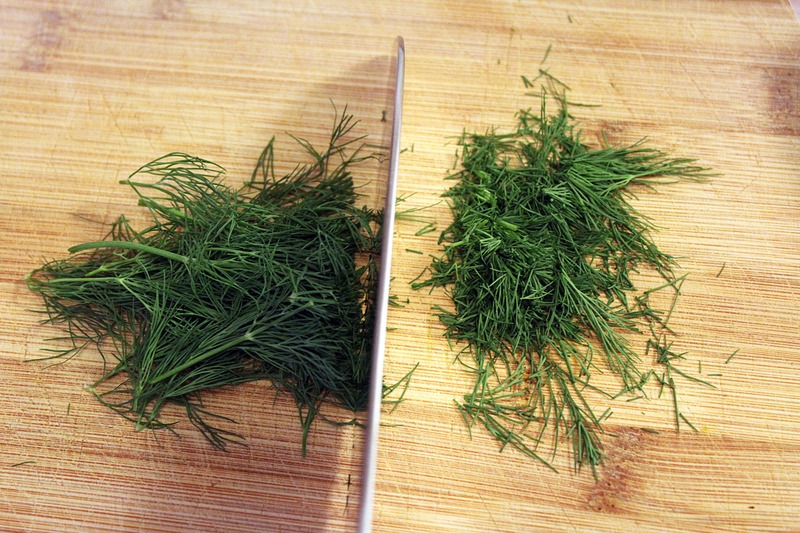 Also, even though fresh dill is the BEST … this recipe also works well with dried dill in case anyone wanted to know. I’ve done it that way twice. Thanks for sharing! I’m so glad you like it. Agreed on the dill- i don’t mind it dried at all.